The Coretronic Culture and Arts Foundation invited jury members to personally visit the shortlisted sites, to evaluate the lighting effects with their own eyes. 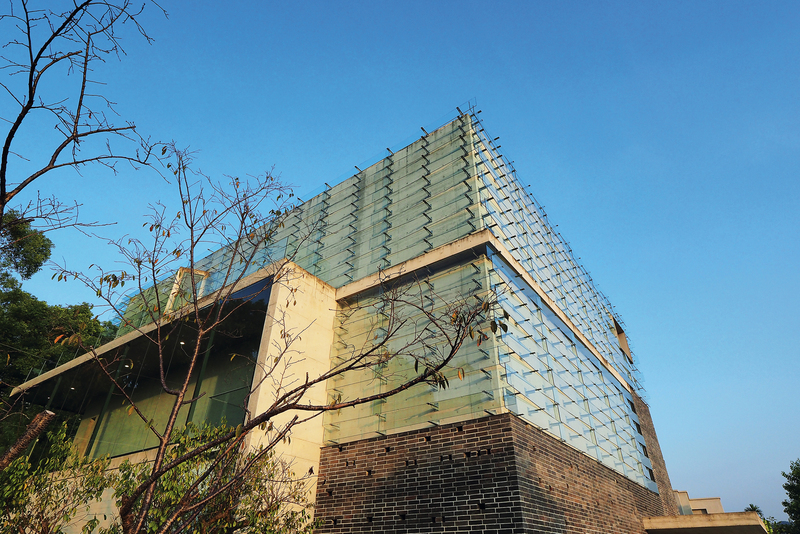 The Yu-Hsiu Museum of Art blends natural light into the façade of the building. Liao Wei-li used the intermediary space of a covered walkway to allow light to calm visitors’ mood before they enter the museum. 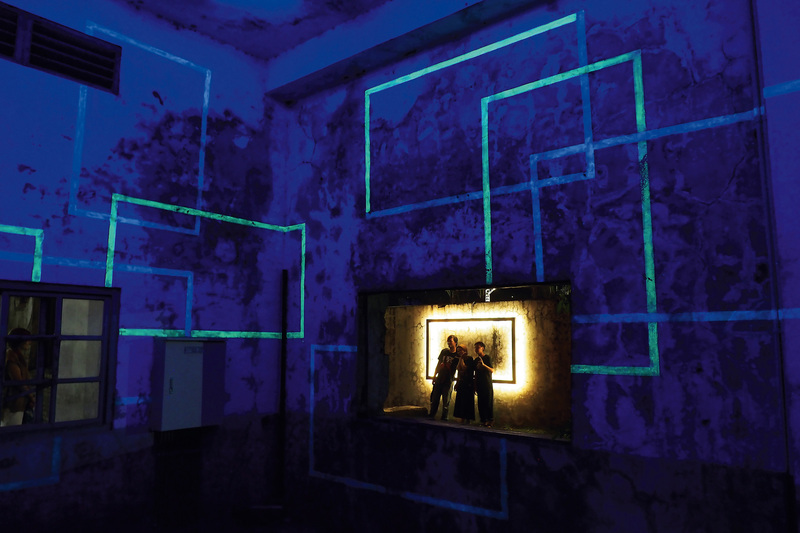 The “Illuminate Hamasen” project combines light art with landscape art, using light to tell a local Kaohsiung story. 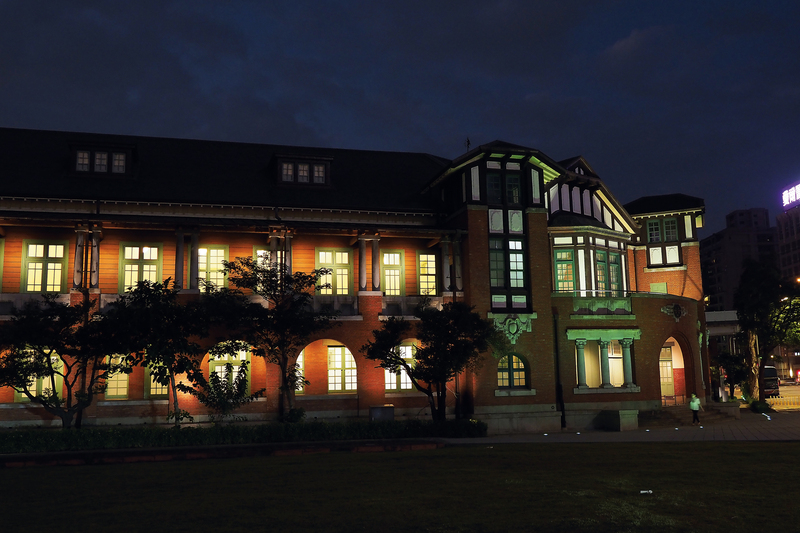 The building that housed the Railway Department of the Japanese colonial government has also been shortlisted for its nighttime lighting design. The warm glow that shines out through each window is the tranquil voice of light. The selection process for the first Taiwan Light Environment Award, whose results will be revealed at the end of 2018, has a special significance. Organized by the Coretronic Culture and Arts Foundation, the scope of entries includes all public cultural facilities completed within the past five years, with the evaluation criteria extending from lighting to the environment. The organizers have invited masters from a variety of fields—including Chou Lien, ­Chiang Hsun, Lin Hwai-min, Hsia Chu-joe, ­Shiue Chyn, and Kuo ­Chung-tuan—to explore the “light environment” from the perspective of their own areas of expertise, in hopes of awakening society’s understanding of the importance of the light environment. “I raise my cup and invite the moon to join me / With my shadow we make up three.” As early as 1000 years ago, the poetry of Li Bai depicted the intriguing nature of light. On Lantern Festival we carry lanterns, at Mid-Autumn Festival we admire the moon, and when there is a power outage we play with candles—in our culture, any moment of picturesque charm requires light to liven things up. But since the discovery of electricity, the light from the ground has hidden the stars in the heavens, and when you raise your head to look at the night sky, you no longer see the firmament filled with starlight. People no longer truly understand the black of night, and our glaring light sources create mental strain in modern people. “What is evaluated for the Taiwan Light Environment Award is not lighting per se, or the functions of light, but the interrelationship between light and the environment,” says Chou Lien, chairman of the jury and an internationally respected master of lighting design. 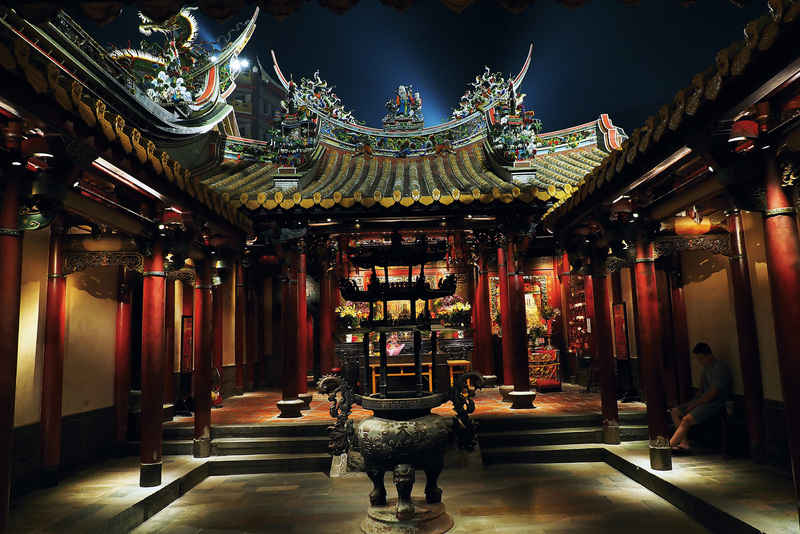 From the lighting design for the Statue of Liberty in New York to that for the old city walls of Heng­chun in Ping­tung County and the makeover of Tai­nan’s Feng­shen Temple, Chou Lien has time and again demonstrated the magic of light. For Chou, light has never been about whether one can see or not or how bright something is; it has always been about the relationship between light and the environment, and about the emotions that light draws out of people. But what is the “light environment”? Chou Lien points to two examples that allow people to understand instantly. Going to the temple to worship and communicate with the gods is part of the daily routine for Taiwanese. But most temples in Taiwan either have rows of fluorescent lights or a dazzling glare that makes it almost impossible to open your eyes. When night falls and the lights go on, the city changes its appearance. But when you walk in the streets, the streetlights shining down from above make the faces of the people passing by appear dark and ugly. 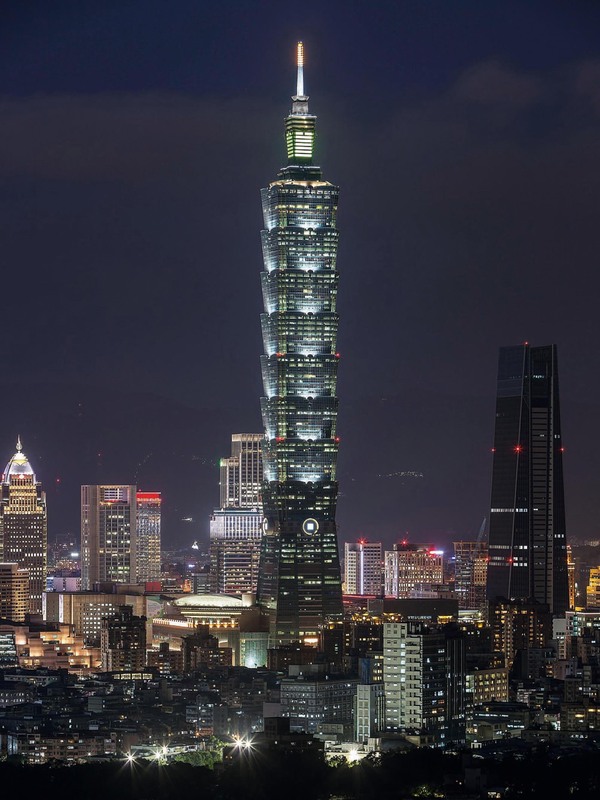 “The design of street lighting in Taiwan only takes account of the amount of light at ground level, but pays no concern to how vertical surfaces are illuminated. The regulations about this should be reassessed,” says Chou. These are both negative examples, but they are things encountered in daily life, and they realistically portray the lack of understanding of the light environment in Taiwan. Most lighting in Taiwan is overly busy, making it impossible to enter a calm state of mind. Lin Hwai-min raises the concept of “light pollution.” We are familiar with “noise pollution,” but don’t know that excessive lighting is also a kind of pollution. In today’s over-illuminated environment, the dark of night has been swallowed up by light, causing the rod cells in our retinas, which enable us to see at low light levels, to become desensitized. This is a very serious matter, explains Chou Lien. Accompanying the jury, we visit several structures in Yi­lan, Tai­chung, Tai­nan, and Kao­hsiung that are in the running for the grand prize. All along the trail we savor the light and shadow of the architecture, and discover that light is not just light—what is more important is the relationship between light and people. The Yu-Hsiu Museum of Art, one of the six finalists for the Taiwan Light Environment Award, was built beside Mt. Jiu­jiu in Nan­tou County’s Cao­tun Township. It was a gift to the township from entrepreneur Hour Ing-ming and his wife Ye Yu-hsiu. The museum’s architect, Liao Wei-li, waits at the entrance to serve as our guide. 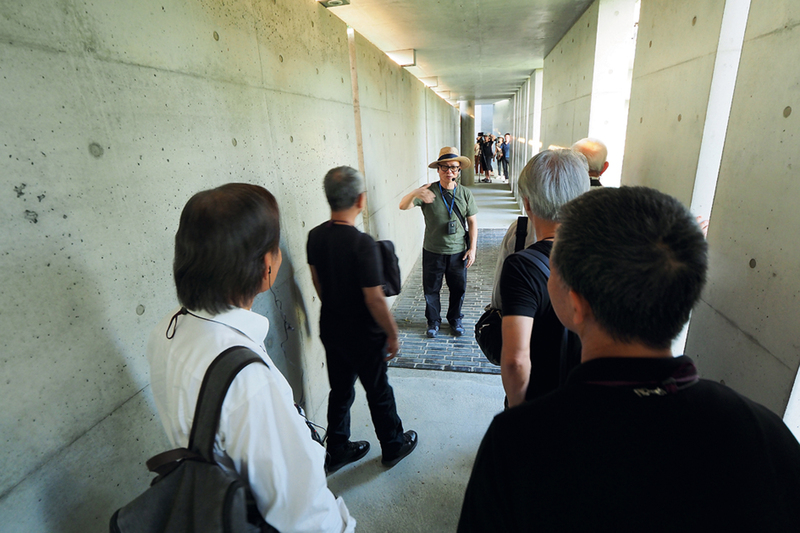 For the benefit of travel­-worn visitors who arrive at the museum, Liao applied the concept of “stopping, guiding and connecting” from traditional gardens to design an intermediary space: a covered walkway with a wall of fair-faced concrete on one side and flanked on the open side by a planted hedge of bamboo, allowing light into the walkway. After turning a corner, there are concrete walls on both sides of the walkway, but the wall on one side is made of panels with spaces between them, again allowing the play of light in the walkway. 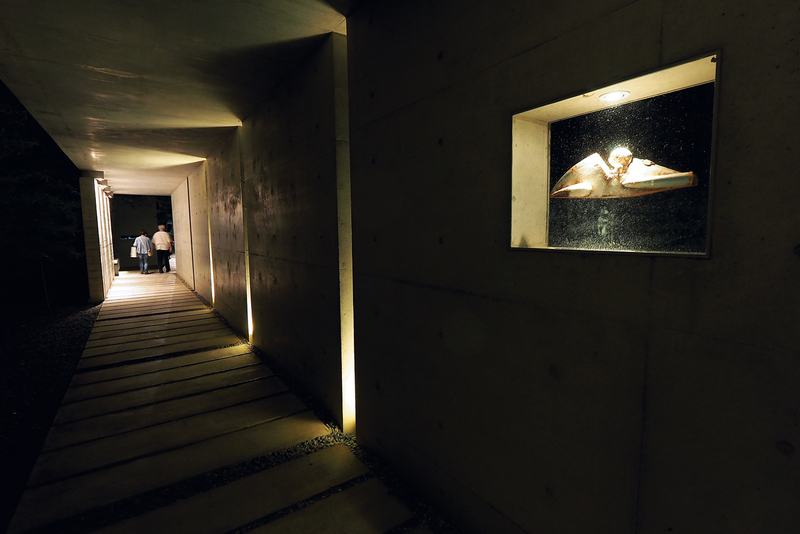 Liao Wei-li says that light has a calming effect, and he used the design of the walkway to allow light to put visitors into a peaceful frame of mind before they begin their artistic journey. The museum building itself has plate-glass exterior walls. The transparent glass seems to connect the structure to the broad sky, and reflects the colors of the different seasons of the year and of dawn and dusk. “Light plays a very important role in buildings,” says Liao Wei-li. The Yu-Hsiu Museum of Art is a wonderful example of architecture in which light and the changing face of nature are expressively blended into the structure. “Street Canvas,” located in Tai­nan, was designed by architect Clarence Tung. Street Canvas I was Tung’s private home, whereas Street Canvas II is a semi-public space. It is a freestanding three-story structure with a coffee shop on the first floor, a dance studio on the second, and the architect’s studio on the third. Tung’s ideal is that beautiful things may be discovered at the street corners of life; he therefore placed this white building amidst small lanes and alleys. Though rather eye-catching, it exudes a tranquil air. The second-floor dance studio faces east, with floor-to-­ceiling glass allowing natural light to enter. During the transition from evening to night, the light that emerges from the dance classroom begins to show leaping silhouettes, becoming a kind of moving painting. This is the notion of “dancing with light” that Clarence Tung wanted to express. “The ‘light environment’ is not simply about location; light tells stories,” emphasizes ­Shiue Chyn. The predecessor to the ­Chung ­Hsing Cultural and Creative Park in Yi­lan County was a paper factory built in 1935 under Japanese rule and later operated by the Taiwan ­Chung ­Hsing Paper Corporation. The factory closed down in 2001, and is now protected as an industrial historic site. In 2017, after renovations of part of the site were completed, the park opened for trial operation. The venue’s lighting design adds to its scenic appeal for night-time visitors. When the factory closed down, in order to quickly monetize the assets the walls of its buildings were smashed through to allow the heavy machinery to be moved out and sold off. This left large stretches of wall in ruins in several of the buildings. 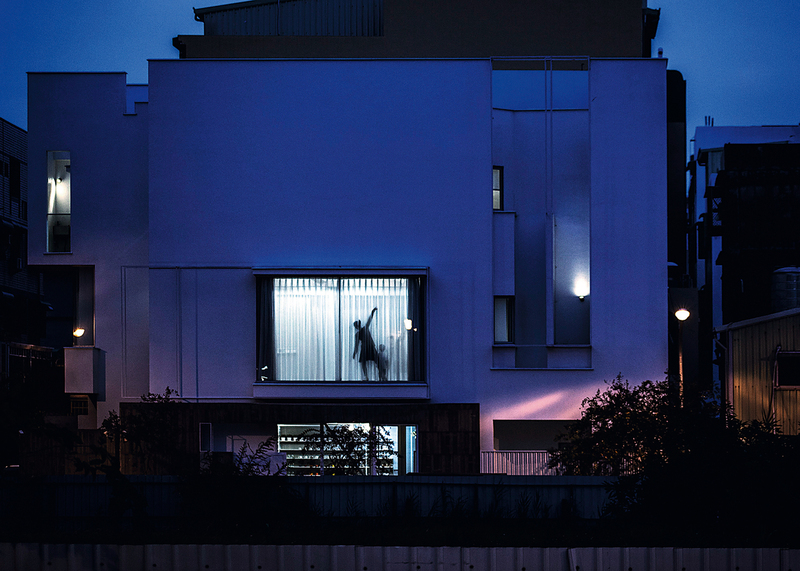 Lighting designer Penny Lin installed lights inside the buildings to create a sense of space. She also mixed different color temperatures to create a sense of layering that blends old and new in the spaces. Lin used revolving stage lights in another abandoned space, creating circulating light and shadow in the room. Moreover, the light shining out through each of the windows seems to contain hidden stories. 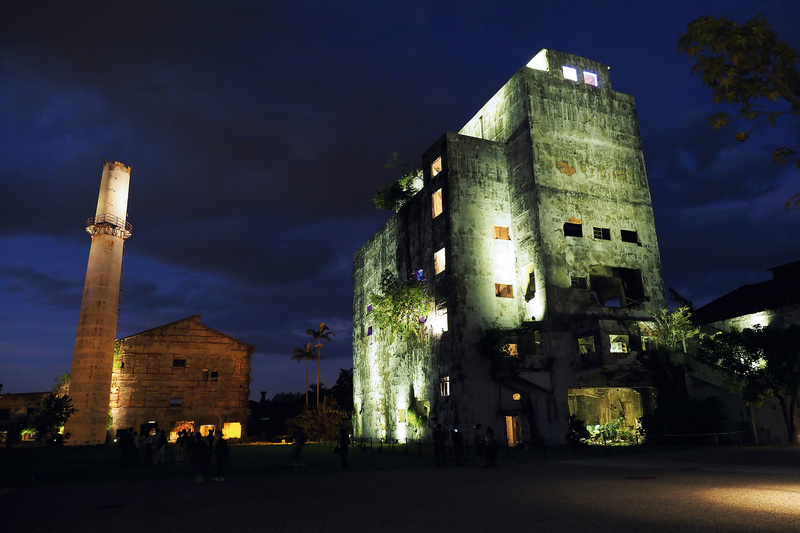 The light that colors the whole site seems to transform it into a theatrical stage, on which light plays out local stories that belong to Yilan. Among the six finalists, the work “Illuminate Ha­ma­sen” is more akin to landscape art. 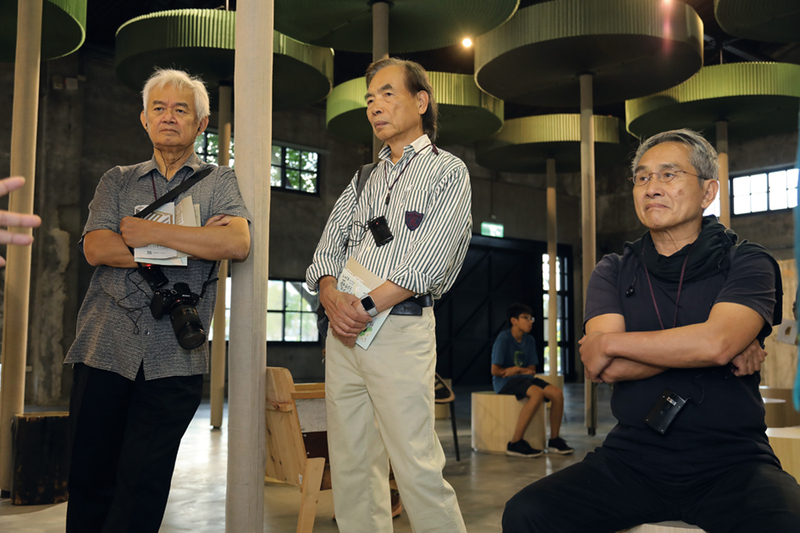 Located next to the Peng­lai Warehouses of the Pier-2 Art Center in Kao­hsiung, the seven-hectare Ha­ma­sen Railroad Cultural Park is the site of a railroad freight yard that in former days was important in linking Kao­hsiung Harbor with adjacent warehouses. The old freight yard, with its curved sidings radiating out in fan shapes, was completed in 1908. With changing times and changing trade practices, this harbor railroad ceased operations in 2008. But the 38 sidings and other stretches of track that were preserved have great cultural value. The Kao­hsiung City Government invited several artists to use digital programming to create flowing lines of blue, white, red, purple and green along the rail lines, with accompanying music. Often children can be seen running beside the tracks chasing the flow of light, making for an amusing scene. Stepping onto the red steel bridge, you get a bird’s-eye view of the whole park. Light adds beauty to the curving rail lines and gives them more prominence. This work sparked great ­interest among the jury members, prompting a lively discussion. 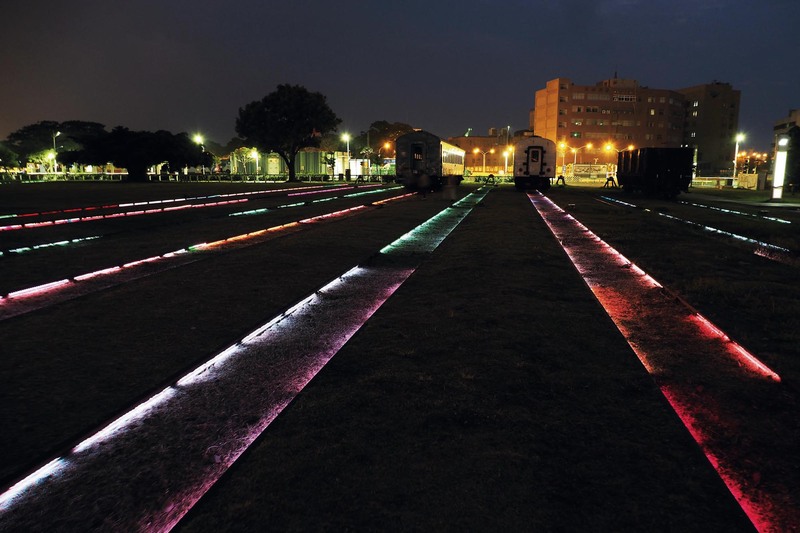 ­Shiue Chyn asked, “Can it tell a story?” ­Shiue, who greatly values cultural heritage, hopes that light can be used to tell a little more of the story, such as explaining why the rail lines are curved the way they are. He hopes to see even more cultural and historical elements expressed in the artists’ designs. In the dark of night, from the far end of the road by which the faithful approach Chao-Tian Temple, you can see the temple building sitting quietly in the distance, bathed in beams of light. Without the daytime hustle and bustle it has a sacred and dignified atmosphere. 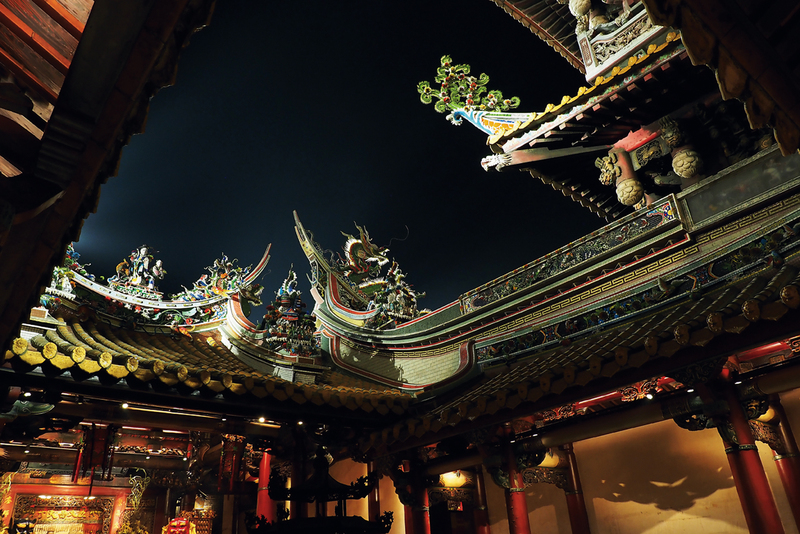 Drawing closer, we see how the splendidly ornate jiannian (“cut and paste”) ceramic art along the temple roof ridges is brightly illuminated against the dark night sky, vividly bringing out the shapes of the sculptures; yet the lamps that project the light are cleverly hidden from view. And when you stand before the front hall and look upward, you can clearly see the carved beams and columns under the eaves, with their elaborate dou­gong brackets, floral-carved hanging columns, and tie-beams. There are few temples in Taiwan where one can clearly scrutinize the architectural details of the interior in such an admirable way. Light is everywhere, penetrating every nook and cranny, but have you ever observed light closely? Perhaps the opportunity for change starts with perceiving and sensing it!